The increase in the Nigerian population is on a surge, and this makes it necessary for new houses to be built as everyone has to seek shelter. This fact has made the building materials business a juicy one, if not one of the juiciest or gainful one in the country. Nigeria has been ranked the most populous African nation and studies have shown that the figures will hit 500 million by 2050, that is a 302 increase from the current 198 million if the surge maintains its present trend. A country like ours tends towards a lack of shelter, and while it is already a problem it may become intensified as the years go by. Building of more houses will of course be the only solution to the Nigerian situation, and this would in turn put the building material business on the spot. “ROI” is a primal factor to expect when settling for a venture. ROI means ‘RETURN ON INVESTMENT'(The profit made on the capital invested). This business like every other is profitable to some, while some accrue loss in the process. All it demands is a lot of input and diligence. This business is not a seasonal business, it is viable all year round and this is because of the importance of housing to Humans, so it is not possible for one to go out of business. The good thing about this business is that one man can not be a jack of all trades within the fold of this venture. One person can not undertake the sale of all materials, it is just for one to find the one which is most suitable for him. There was a man who sold his car and invested the money therefrom into the business and in less than a year, the business was already standing and booming and he had gotten another car. Profitability like I said before depends on input, consistence, and how far the entrepreneur is willing to go. Africa is known world over for its fast pace growth in terms of population and the importance of shelter has made for a further boom in the business of real estates. There are so many people in the business but this shouldn’t be a discouraging factor as the manner by which a business is being run goes a long way in determining the success of such. Garner experiences and ideas from successful ventures around you and be unique in your ideas, also look at the failed ones so that you may steer clear from the mistakes they may have made. A woman once said; “learn from other people’s mistakes for you can not live long enough to make them all by yourself”. What is the need for making the same mistakes in your growing process when you can learn from the ones already made by other people? Now that you have perused through all the points stated before, we may now lead you through how to start your own business materials business. Be sure to ask questions and make your own research, do not confine yourself to this material alone. The more you learn, the longer you lead. Deciding here simply means for you to choose what suits you best. There are two phases to making a decision, and the first question should be; ‘do I want to venture Into this business’? You should be able to easily determine this if you have been reading from the first point till now. You must have the desire, passion and a burning interest in the business, for if you have no passion for what you do, you will never do well or you will never have astounding results. Secondly, you must determine the area or sector you wish to specialize on as earlier stated before, you can not cover all areas so stick with the ones that work for you. Also, your sole aim of getting onto this business shouldn’t be just about making monetary gains but how you can uplift the sector and contribute your quota to society. Knowledge should always come before action. You must ask questions, gather knowledge and expertise on the subject matter and understand what you are getting f yourself into. Questions such as what is my responsibility? Which area or facet of the business should I concentrate on? Where do I get noteworthy suppliers? Where shall I situate my business? How do I hone my skills in customer service? And so on. Knowledge indeed is half the completion and success of a task. 3. Draw a business map. Getting into a business like most entrepreneurs believe, doesn’t just involve having enough capital, knowledge of the business and good business acumen. The crux of a business is the map drawn. Just like a world map, it makes it easy for one to navigate the intricate areas of the business, hence things become easier. *It makes your business easier and helps you to locate problem spots. *It make it less difficult to convince investors to commit to the business. It also makes it easier for you to understand the kind of people you need on your team, and what their tasks will be when they have been employed. Where here stands for location. Where am I going to situate my business? This determines how gainful and even successful the business is going to be. In starting a building materials business, you must look for areas where patronage will be high, not somewhere that people would hardly look your way. Look for where there is need for your services. This includes places that are still under construction, places where there is a surge in building constructions. The location of a business is the meat of the business, and goes a long way in ensuring its success or otherwise. You may simply rent a building for your business for the main time. 5. The money factor/ finance. The capital or finance is the life wire of the business. You can do absolutely nothing without capital. It is with the capital that you acquire everything needed for the business. Most people complain about lack of business capital but this shouldn’t be much of a problem as loans can be collected from financial institutions, friends and families may also help in raising funds, from investors, one may also save for the business over a period of time. Do make sure to have a well written business plan for Selling building materials or map with convincing points that would attract the minds of prospective investors. Our sample Building Materials Business Plan in Nigeria can be used to access bank loans, proposal writing and grant applications. 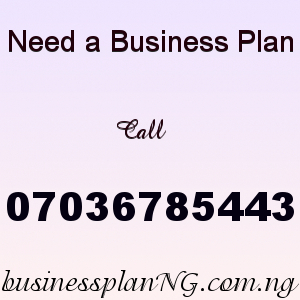 The business plan was complied after a thorough feasibility study on Building Materials Business in Nigeria was done. After you have made payment for your Building Materials Business Plan in Nigeria & Feasibility Study, send your email and payment details to 07036785443. Once your payment has been verified the Building Materials Business Plan PDF will be sent to your email.